Fired Up! 2016 was a great success. The participating artists give a warm round of applause to all the friends, sponsors, and collectors who supported this annual event. We couldn’t do it without you! ​ Experience and expertise are two key ingredients of the Fired Up! ceramics collective. This talented group of professional clay artists mark 32 years of annual exhibitions in 2016. May 27, 28, 29, 2016. Hours: May 28 & 29, 10am - 5pm. 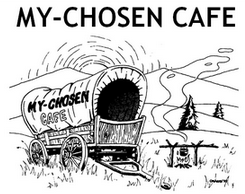 Opening is Friday evening May 27, 6:30–9pm. Metchosin Community Hall, 4401 William Head Road, Metchosin. 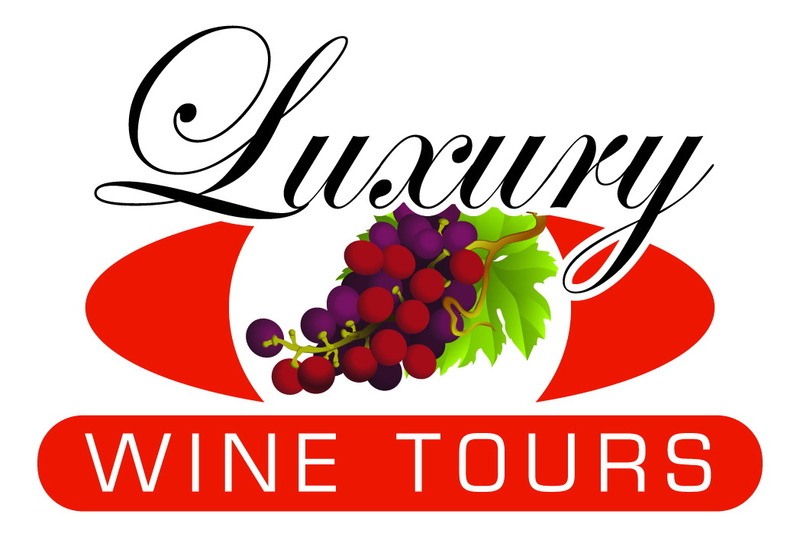 ​Talented guests are: Robin Dupont, Kasumi Lampitoc, Vincent Massey, Debra Sloan. 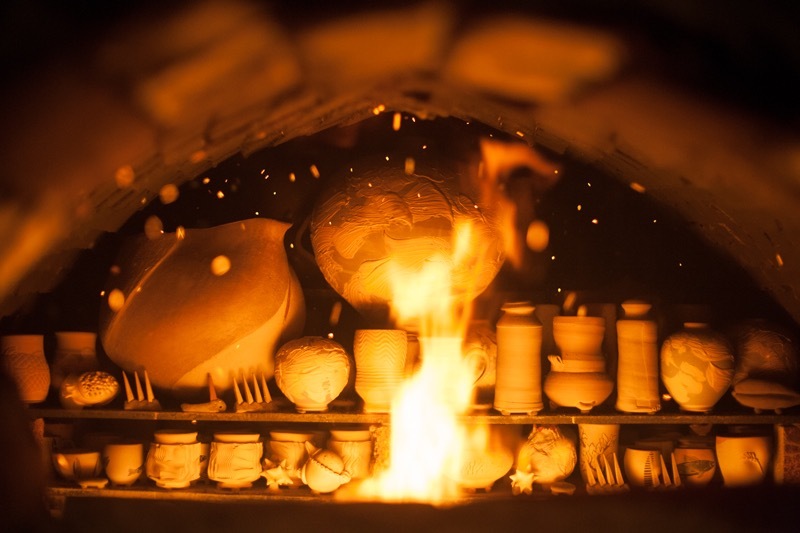 Wood Firing: The Art of Earth is this year's theme.The idea springs from an inspiration book about ceramics, compiled by Rona Murray and Walter Dexter, called The Art of Earth. The wood firing happened on the Denman Island property of Gordon and Sandy Hutchens, April 21-24. The voracious Tozan Anagama (or cave kiln) was stoked every 15 minutes for three days, using up five cords of wood to achieve firing temperature. 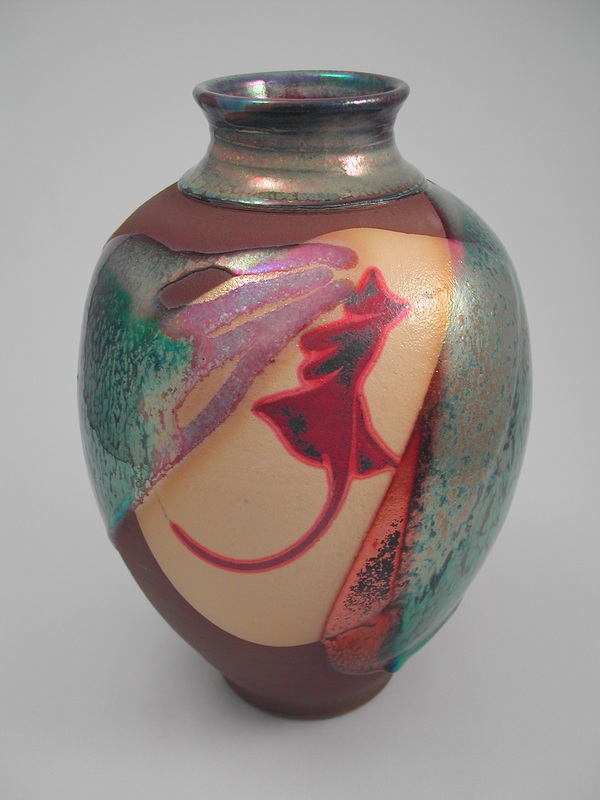 The flame and ash create chemical reactions that alter glazes and colouration. The cool down period is several days, the unloading happened April 30. Photos below tell the before and after tale. ​Wood firing event at Gordon and Sandy Hutchens Denman Island property in April 2016. 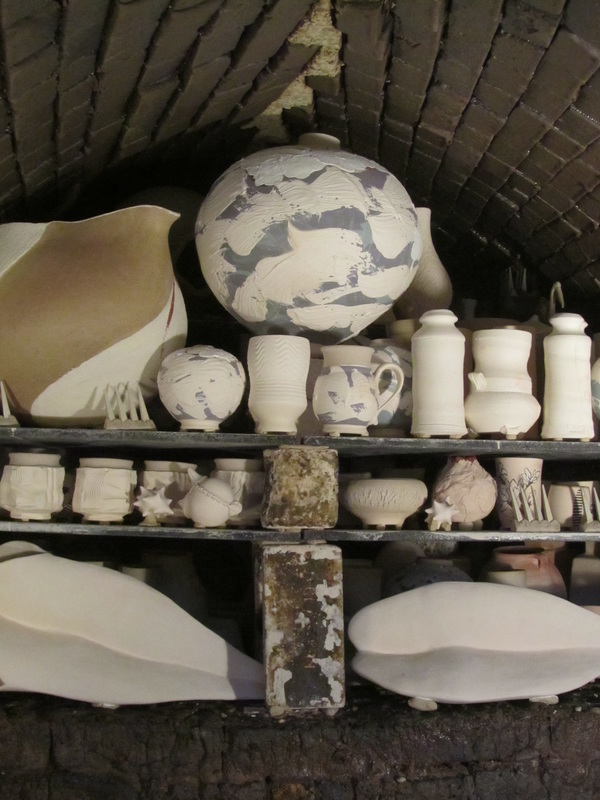 Before and After: Loading the kiln and stoking the fire produces many beautiful ceramic objects. Above: large basket form from Meira Mathison. The Anagama kiln comes with a fascinating history. China’s first emperor, Qin Shi Huang used this type of kiln to make his life-size Terracotta Army of warriors and horses in 200 BCE. Excavation of the mausoleum in Shaanxi province is ongoing with estimates of 8,000 soldiers, 130 chariots and 600 horses, still buried in three pits. The army was designed to protect the emperor in his afterlife. Wanting to keep the location secret, the emperor decreed a death sentence for all workers. Those who escaped to Japan and Korea took the technology with them. Hutchens Earthenware Vase. Cone 02 Lustre Glazes. Reduction fired. 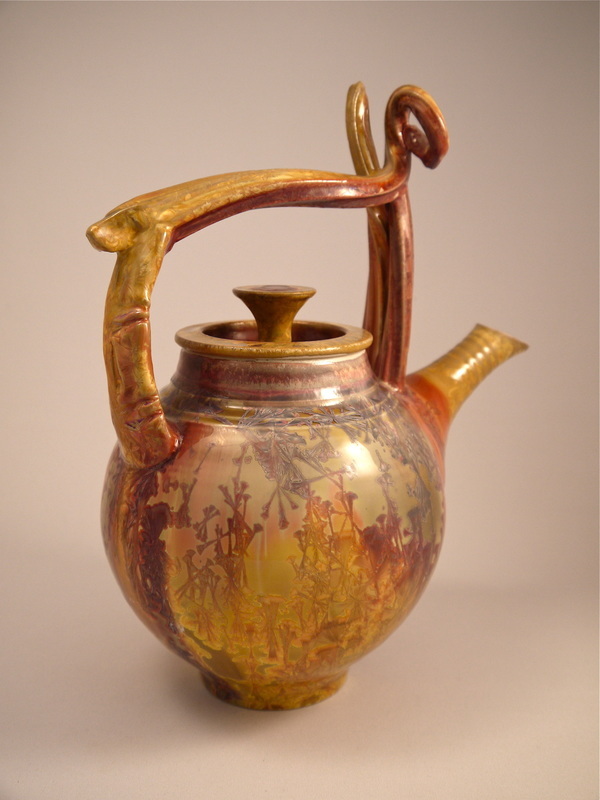 Hutchens Porcelain Teapot, Reduction fired Crystalline Glazes. Hutchens Ocean Waves, Porcelain, Wood Fired, Natural Fly Ash over Slips. 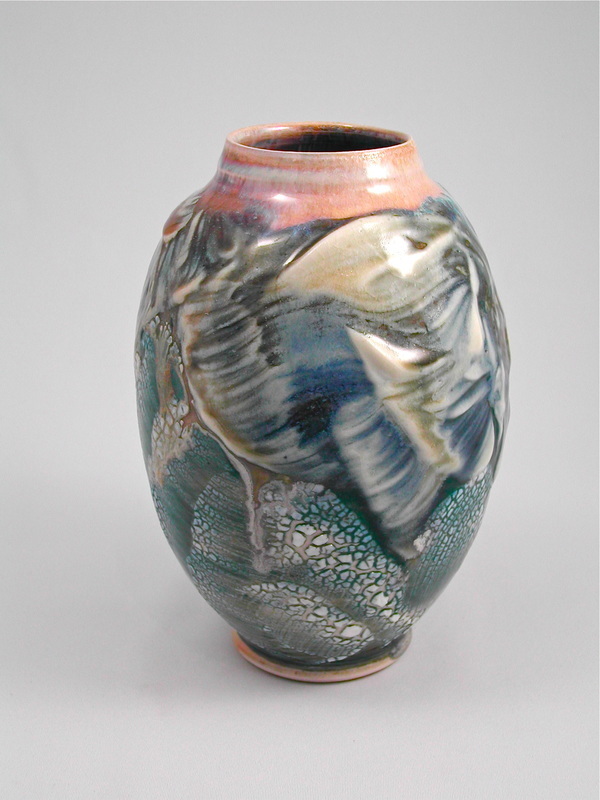 At age 14 Gordon Hutchens visited a wood-fired kiln in Japan and was intrigued by the process and product. He noticed the sophisticated results from the traditional design. Since that time, Hutchens has delved into the alchemical science of glazing. He marvels at the complex reactions of heat, clay and mineral pigments. Hutchens’ exquisite palette of iridescent surfaces and rugged wood-fired finishes delight collectors. He is an original founding member of Fired Up! ​its proportions and balance, the fingermarks impressed on its wall, are the simple statement of its creator, spontaneous and as personal as his handwriting." Jug with serving set and tray. Meira Mathison’s ceramics radiate vitality and gestural energy. Each piece is unique. After throwing a pot, she often manipulates the form, adding liquid slips and several layers of glazes. Many of her pieces fit together in sets and suggest family relationships and bonding. Fond of the roguish intellect of crows and ravens, the artist sculpts black clay heads that harbour human expressions. Mathison is currently working on sculptural forms that are technically challenging. Resembling sea-washed stone, these fecund flowing sculptures are both enigmatic and graceful. ​A member of Fired Up! since 1984, Mathison applauds the professional development of the group. “The members support, inspire and motivate each other,” she says. 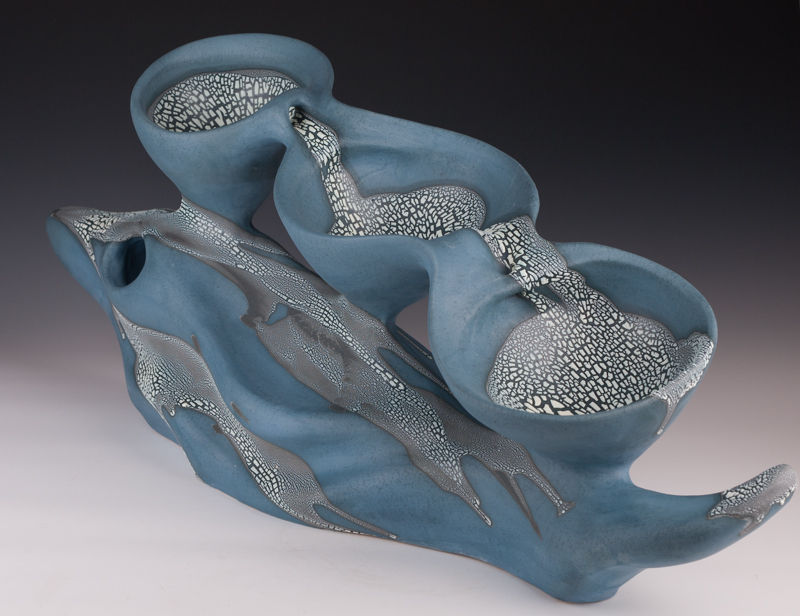 They’ve exhibited at the Canadian Clay and Glass Museum in Waterloo, Jonathon Bancroft-Snell Gallery in London, and two US conferences hosted by the National Council on Education for the Ceramic Arts. Mary Fox is an accomplished ceramic artist living in Ladysmith with an international following. Now 56, she discovered her predilection for clay as a teenager and forged her career as a self-taught professional potter. 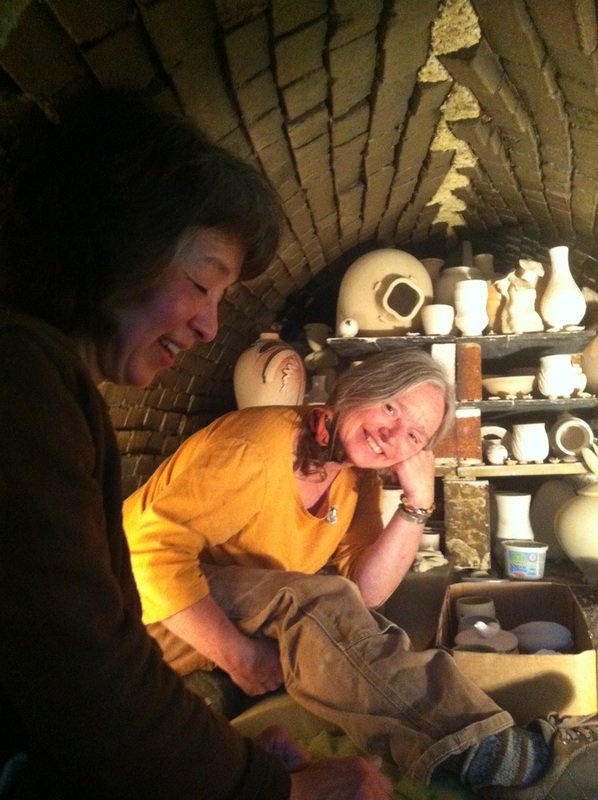 Remembering her own challenges, Fox aims to help emerging potters by creating a Legacy Project. She plans to bequeath her studio location as an artist-in-residence space. 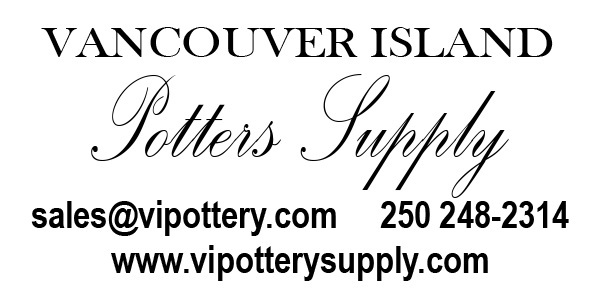 Ladysmith Pottery is currently receiving status as an Economusée site and will become an artisan destination point. Fox’s glazing techniques, honed from years of experimentation, add a unique crackled patina to the exterior of her chalices. This gives her elegant vessels the look of newly unearthed antiquities. Before going to the wheel, Fox attains a calm centered state. The still point must be inside the potter in order for the form to be successful. “How I am feeling is in the work,” she says, “my loving intention guides the creative process.” In Victoria, view Fox’s stylish creations at Winchester Galleries in Oak Bay and The Gallery at Mattick’s Farm. At the centre of every vessel thrown on the wheel is a point of stillness, which remains still, whatever form the clay assumes. The form of the vessel measures movement in relation to this point. The variety of possible forms is endless. Candleholder with Boating Frogs, wood fired in Anagama kiln. 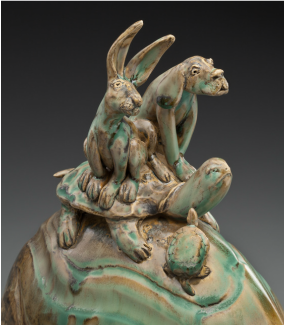 Detail: Hare and Dog traveling on Tortoise, reduction fired, copper matte glaze. Each summer for the past 23 years, Webber has wood fired at an Anagama kiln in Oregon. She believes the process of wood firing is a metaphor for living well. “The effort requires teamwork, planning ahead, strength and perseverance,” she says. Every firing has its surprises, delights and disappointments. Webber enjoys wood firing with the Fired Up! crew. She describes night-shift stoking as a bonding experience, with sounds of nocturnal animals alongside the roar of the kiln. Singing in harmony or telling stories passes the time. Each year friendships evolve and deepen, with work being the common thread that binds them together. She has been with Fired Up! since 1984. Above: Webber at the unloading of an Anagama kiln in Oregon. At right: wood fired jug with unusual markings. 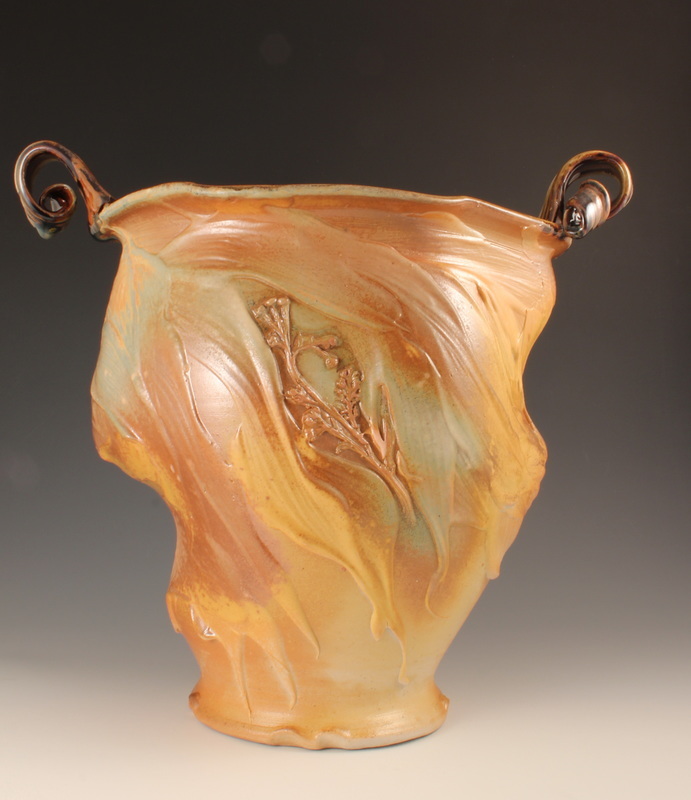 Like most of her pieces, the jug combines both thrown and hand-built techniques. Public Relations certificate from ​University of Victoria. ​“Above and Beyond” award hosted by Black Press. ​Written permission is required for reproduction of photos or text.